Sounds like an Asian dish but it’s our food trials. 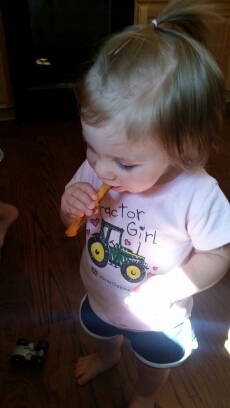 Gage and Tinleigh are both trialing sweet potatoes and its going great. 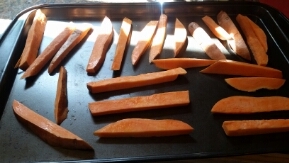 So far homemade sweet potato fries are the favorite way to eat them. I’ve also found some crinkle fries. They’re a bit pricey though, as all allergy food is. When making my own i skin and slice the potatoes then rub the sticks in olive oil. I then place them on a baking sheet and bake at 380 for 15-20 min flipping them half way through. Sometimes I sprinkle them with salt, sometimes cinnamon and sugar. 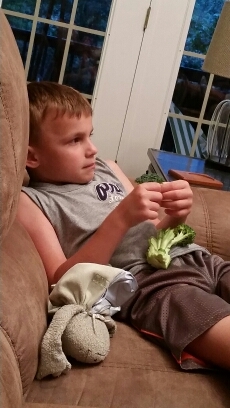 Gage is the one trialing broccoli. He likes it raw and will eat an entire head of it if i let him. I’m so glad my kids like fruit and veggies. 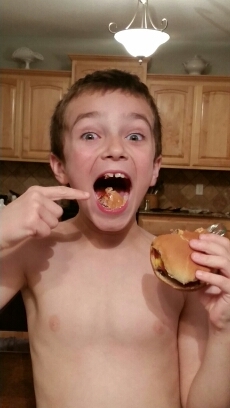 Gage had tried pineapple but his mouth became itchy and broke out in a few hives. 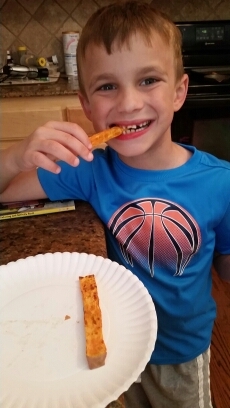 Gage also tried watermelon and broke out in hives around his mouth after a few bites. 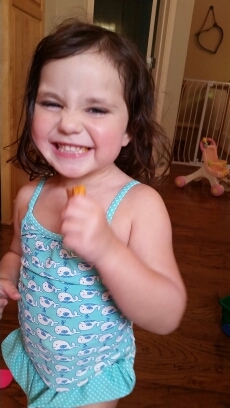 Tinleigh loves oranges. 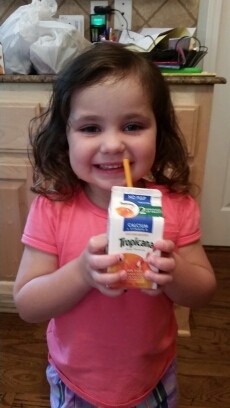 She especially loves orange juice cartons! Charlie is the lucky dog that gets to trial beef and its going great. 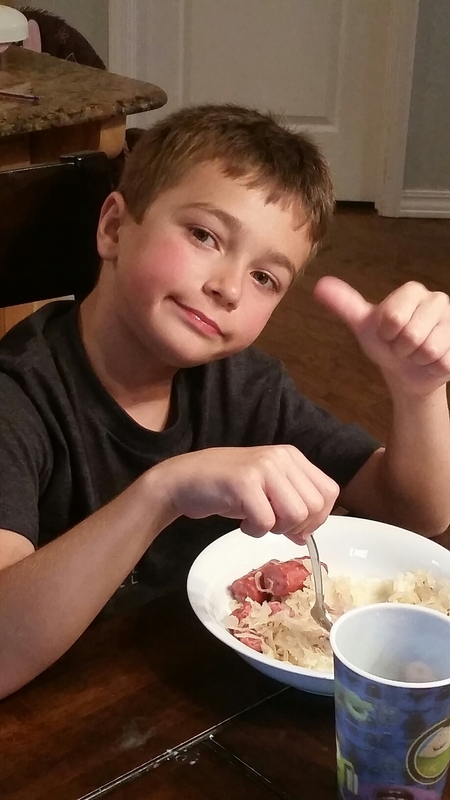 Here he’s trying beef sausage and sauerkraut, not his favorite. He’s had hamburgers, steak, beef hotdogs and beef roast. Everything agrees with him from an ige allergy standpoint. I’m so happy for them all! Layton’s milk trial is going great too!! She wont drink it plain quite yet and hates cheese and yogurt. We still keep offering it to her in hopes she’ll eventually eat them. She loves to sneak food off the others plates every chance she gets! 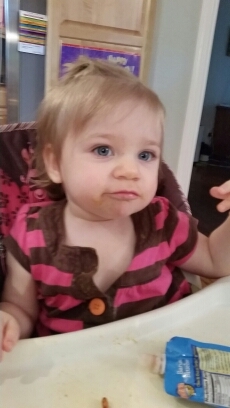 It’s so strange to just throw food on Layton’s tray and not have to think about if she’s allergic. 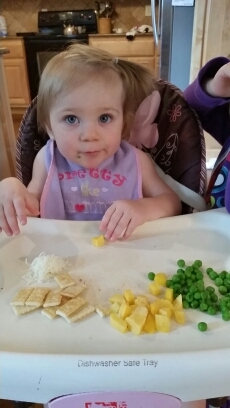 Tonight it’s peas, mango, crackers and shredded mozzarella. 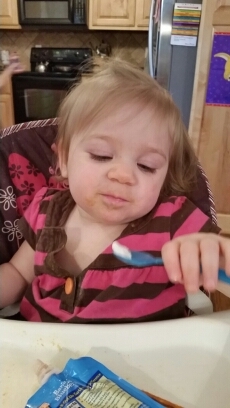 She has 3 molars but is still choking in meats, so she gets that through baby food at this point. One happy mom right here!! I think it’s probably safe to say all moms go through a phase in their life when they lose their true self. You get married and make it the best marriage you possibly can. Then you begin to have babies. A baby will make most women the most selfless person she could ever be. What a larger population of moms don’t experience is having a child with special needs. 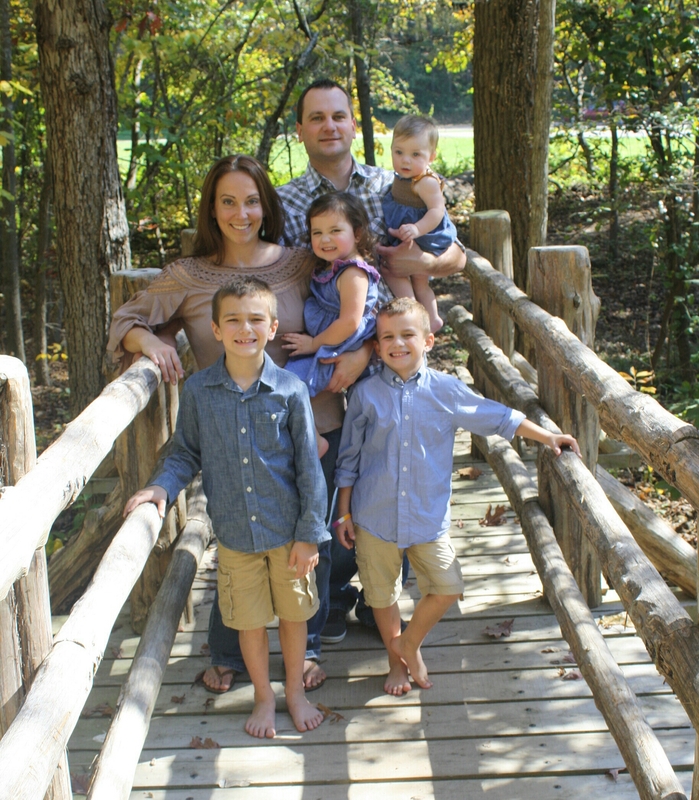 Four years into being a mom I was blessed to become one of those moms. That’s when i started this blog. At the time I was going to conquer the world of allergies and EoE with enthusiasm and show people how to still live. Here we are 5 hears later. I am definitely not that same mom. I am whipped. I struggle a lot of days to just make it through the day. Pushing myself to keep everyone fed, loved and safe. Often repeating “if i can just make it to bedtime tomorrow is a new day.” I was recently talking with someone I had just met and they asked what I like to do for fun. What are my hobbies? I laughed. This person doesn’t know quite everything we have going on with the kids. I said well the kids consume my every waking moment. There’s 4 of them and that’s a lot to have going on even if we didn’t have issues. So add all their medical needs and special diets in there and that’s my day, my every single day of the year. I got a funny look as i explained i have no hobbies and i don’t really ever do anything for myself. 1. I have no time. 2. Between the medical bills and grocery bills i feel guilty spending anything on myself. This got me thinking. What am I most unhappy about aside from the kids having issues? I feel like crap. I have zero energy. It’s like they’ve sucked the life out of me. I hate that I haven’t lost the last of the baby weight they gifted me. I have become a secret eater. I sneak things when they’re not looking because i feel bad eating in front of them. Nathan and i eat dinner after they go to bed because we don’t like them sniffing our plates of food they can’t eat. Eating right before bed is definitely not helping the baby weight come off. I need a change. I tried clean eating for a while, but i would have a bad day and end up having a binge of emotional eating ruining all my efforts. Do other moms of kids with needs binge eat or does the stress do the opposite and they don’t eat for days? I’m not one to have a drink to help unwind and relax. I’m always afraid we’ll have a situation where someone needs to go to the ER the moment i finally do start to sit back and relax with a glass of wine. After some long thinking and debating in my head I came to the conclusion that i was going to get ME back. Fun, loving, energetic, in shape ME! I then began a great debate in my head. A lot of my thoughts were, i don’t have any extra time. How in the world will i possibly cook another meal? How will i find time to exercise? If i take this leap will i let myself down? I had a plate full of reasons why I couldn’t find myself again. You know what I did? I threw the plate of excuses it in the trash. I picked myself up and I started a 24 day challenge. I started a transformation to become the old me again. You know what, I did it. I completed my challenge and it was easy. I am on my way and not stopping!!! 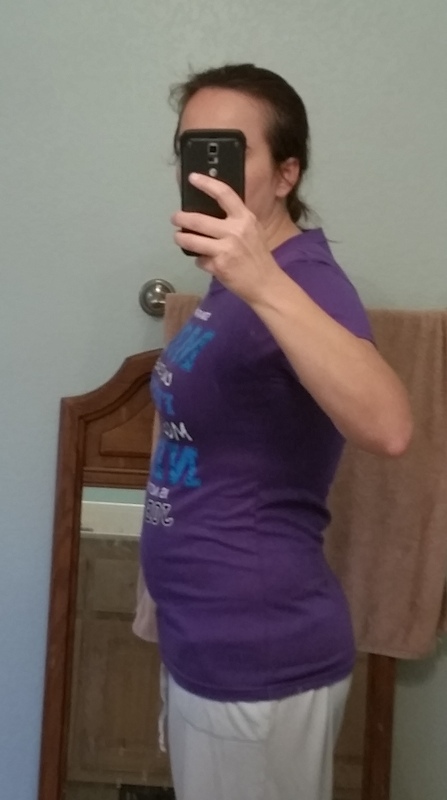 I dropped inches and pounds and I’m still going! I feel great. I have energy. I don’t wake up in the morning trying to figure out if I might be able to take a nap. I can keep up with the dishes and laundry. I took all 4 kids to the pool this week multiple times and I wasn’t exhausted. I’m exercising about 20 minutes a day. Funny thing is I want to! I can see my results and it’s pushing me to keep going. The girls even exercise with me. It’s adorable. it’s second nature to me now to want to eat healthy all day. I prep my meals for the week on Sunday so I’m not tempted to grab something fatty instead. Sure, I’ve wanted a chocolate brownie. Yes, I’ve had a bite of one. I have not binged at all. I even eat breakfast instead of drinking coffee until lunchtime. My emotions are still high, because I constantly have little people begging me for food they can’t have. Little people having food reactions, not wanting to hook up for a feed, upset because they miss tacos and hot dogs. None of that will ever go away. I am however, feeling good about myself and happy. I think in turn that’s helping me cope with everything the kids have going on. I am so worth this! 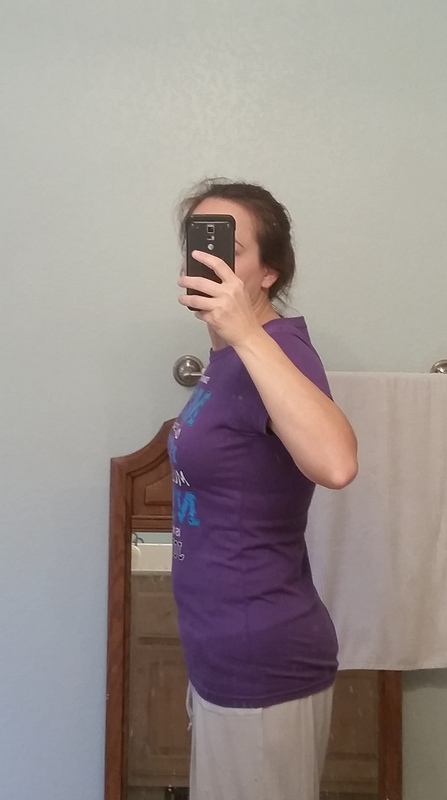 It is helping me be a happier healthier mom. I definitely think that if I can do this anyone can! Any mom dealing with day to day special needs kids needs to take care of herself and I forgot that. These kids need me more than anything. I’m almost 30 days into this “finding ME again” journey, so far, so good. Charlie has fallen in love with beef. 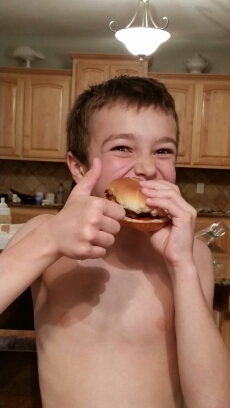 He loves it, and so far it agrees with him. 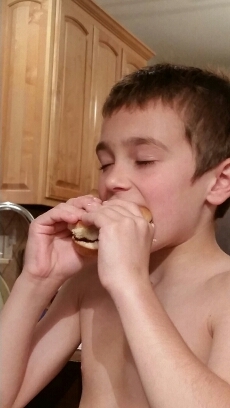 We didn’t just hand him a burger to start with. We started by rubbing some on his lips then he took small bites building up to larger bites over a period of an hour. Knowing anaphylaxis all to well we know better than to just go at a new food full throttle. We did the same with Layton and dairy. We first just gave her a drop of milk. Then an eighth of a tsp and so on. She really doesn’t like the taste of it yet. So we’ve also given her a small amount of bryers vanilla ice cream. 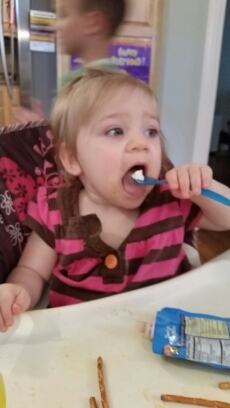 She had blood in her stool as an infant with dairy so we’re not going to give her large amounts until we’re sure she doesnt have that issue again. We don’t want to cause her to have belly pain. So far it looks promising!